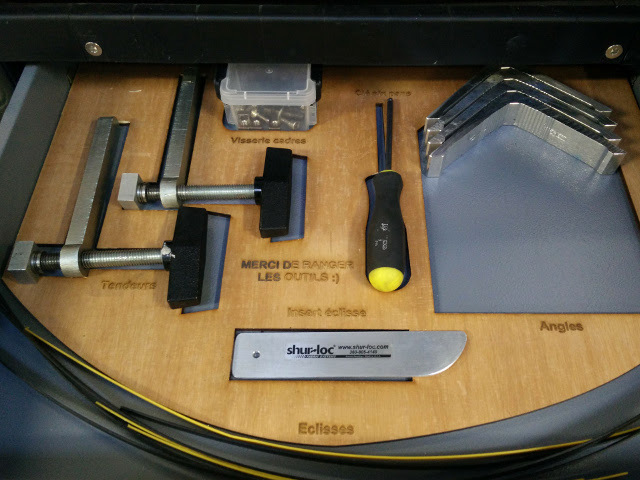 Last year at the Maker Fair Paris, I won a weeks trial at Techshop from OuiareMakers. 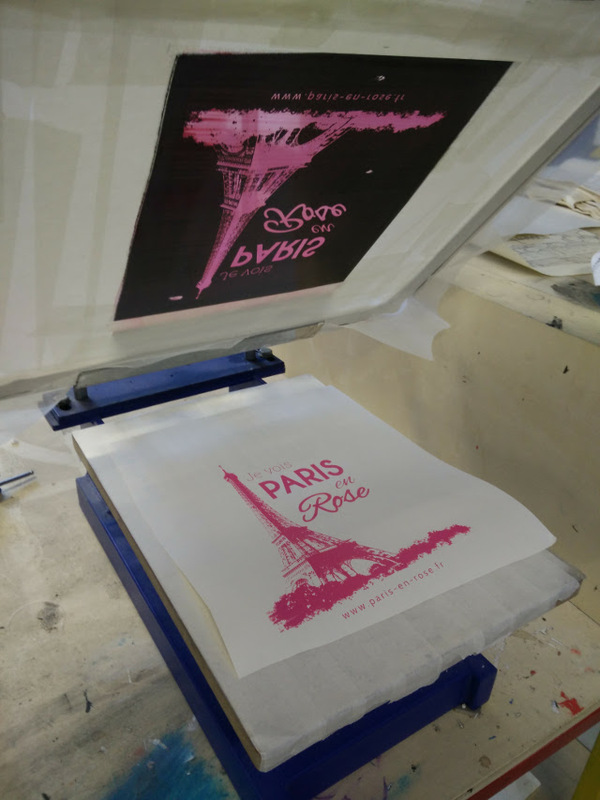 I chose to try out screen printing at Techshop to make some cool Paris en Rose designs. It took me a while to do it, and even longer to write about it, but here is an account of how it went. 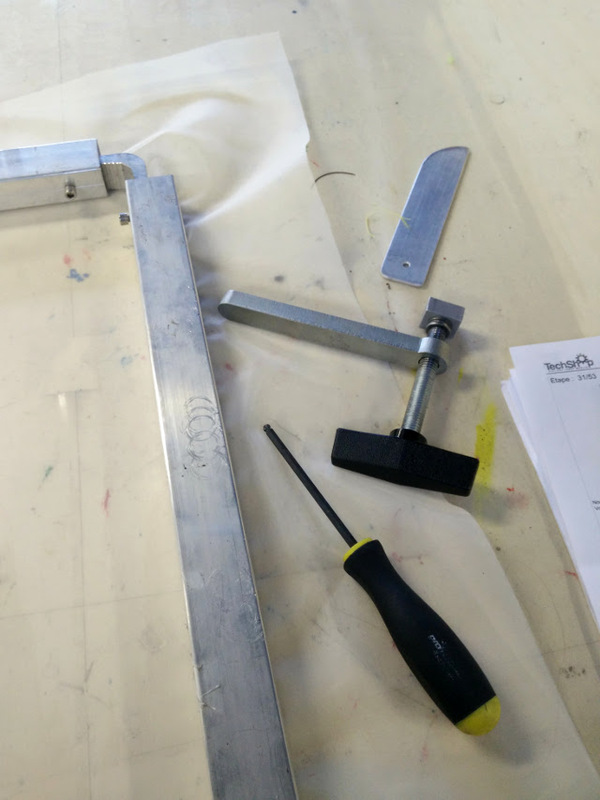 This article isn’t going to be a complete tutorial for screen printing, more a summary of what Techshop is, how it works, and my week spent there. 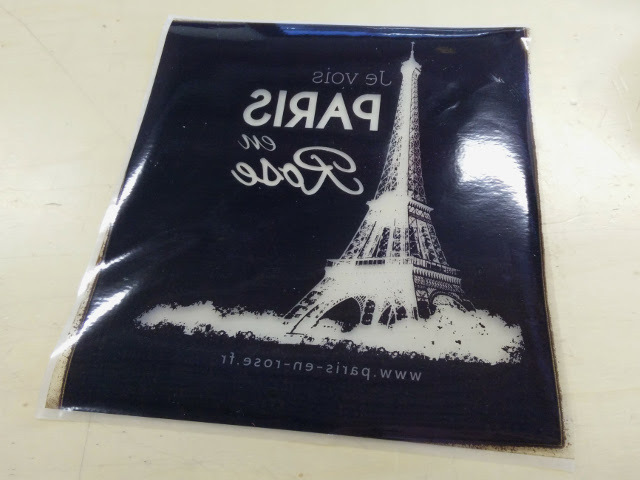 I will explain briefly the technique used and the steps involved for screen printing, but if you are interested in trying it out, you can do your own week trial to follow the course in more detail. 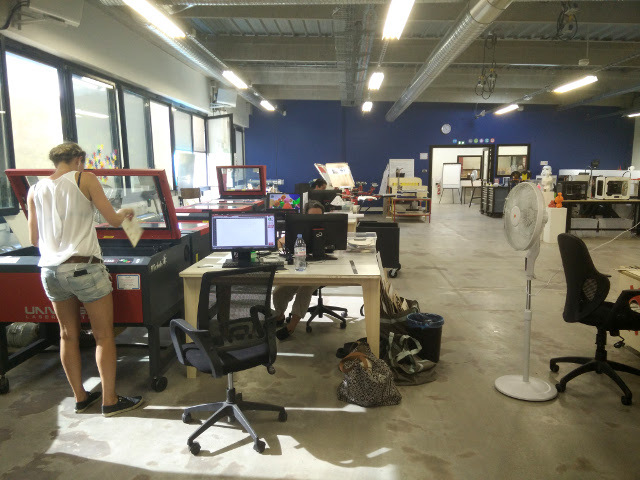 I was really excited to discover Techshop and to have the opportunity to try it out. Techshop is a workshop containing all kinds of tool and machines for creating all kinds of objects (such as tools for woodwork, textiles, metalwork and electronics, laser cutters, printers, 3D printers) as well as a co-working space including a kitchen, workstations with power and wifi, and desktop computers with professional software installed (such as the adobe suite, AutoCAD or CorelDRAW). 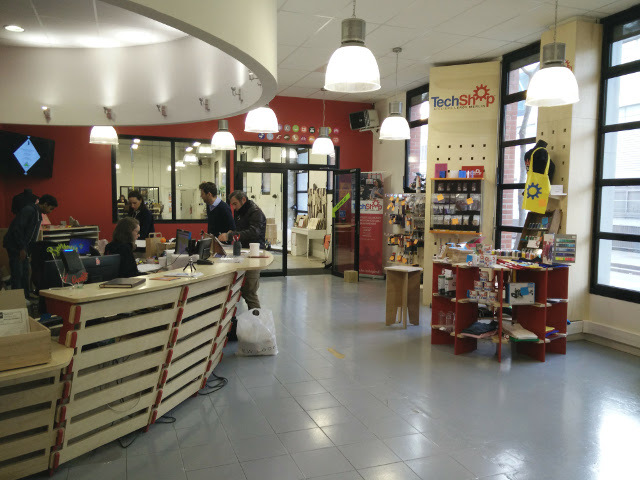 Access to the workshop is based on a monthly subscription from 50€ – 300€ per month based on the time of the day (mornings, evenings and weekends, or unlimited) and the length of your subscription (12 months, 3 months, or month by month). Before using any of the machines, you also need to take a short course to learn how to use them. 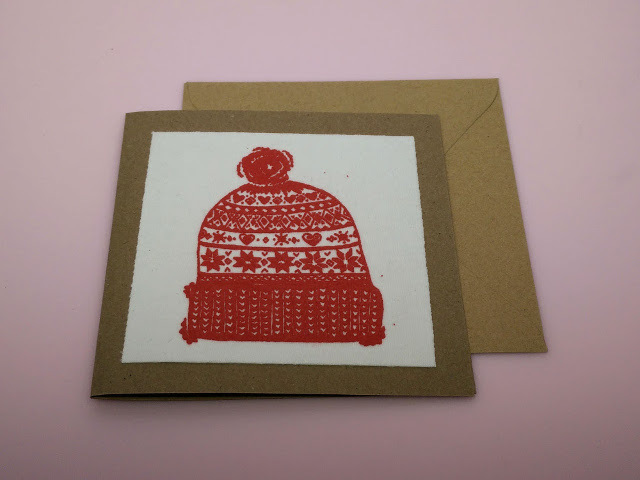 I had one of these ‘START’ courses included in the free trial period that I won, so I decided to give screen printing a go, since its something I had never tried before, but always wanted to. I did my START course in August. I was actually the only person doing that START course on that day, so it was just me and the Dream Consultant, Alix, who was super friendly and even gave me a tour of the rest of the workshops. 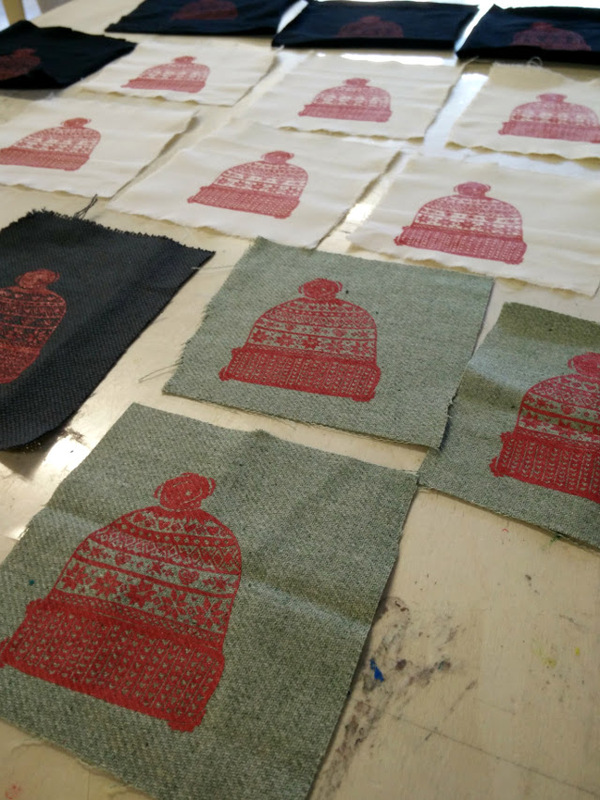 The screen printing course was all really well organised and explained, I was given a small booklet with all the necessary instructions, but we went through the whole process together, step by step, with lots of tips and advice. 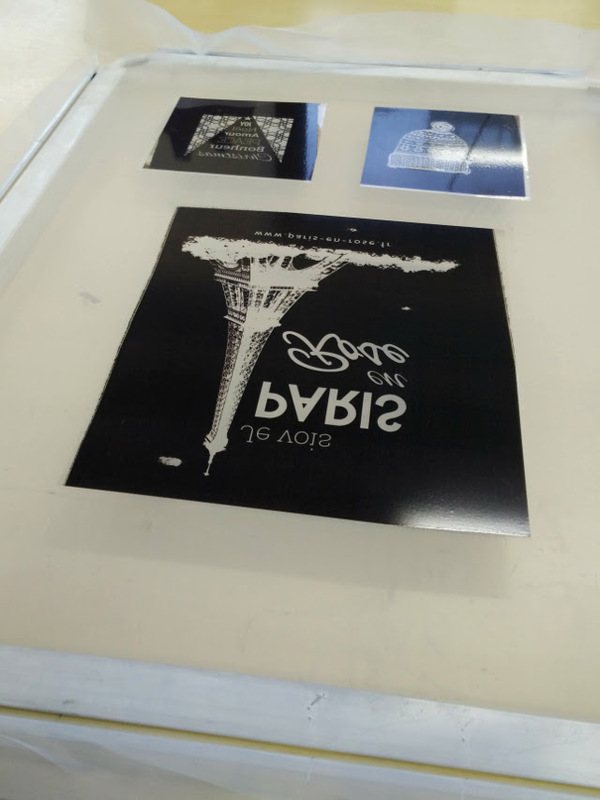 During the course we printed a design, made this into a screen, and printed the design onto a white t-shirt. The only negative thing about the day was that I arrived without really knowing what to expect from the course, and without having prepared anything. This turned out to be a little frustrating, since we didn’t have much time for the design part of the process, so I ended up just choosing a really basic graphic off the internet, rather than something I would actually want to wear. If I had known in advance exactly what we would be doing, I would have planned a simple design in advance. I ended up doing my weeks free trial quite a long time after the START course, in December. This meant a lot of the method wasn’t so fresh in my mind, and it took me a while to back into it. It also took a little while on the first day to process my subscription, so my first day was a little less productive than it could have been! 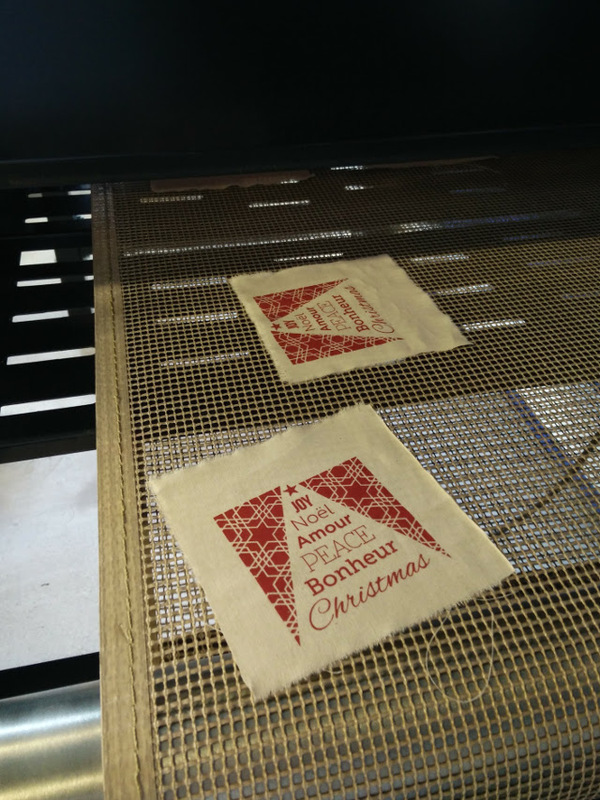 However, in just 3 half days at Techshop during my trial week, I managed to print 50 tote bags, several t-shirts and hoodies, and many more small designs on recycled fabric for Christmas cards. 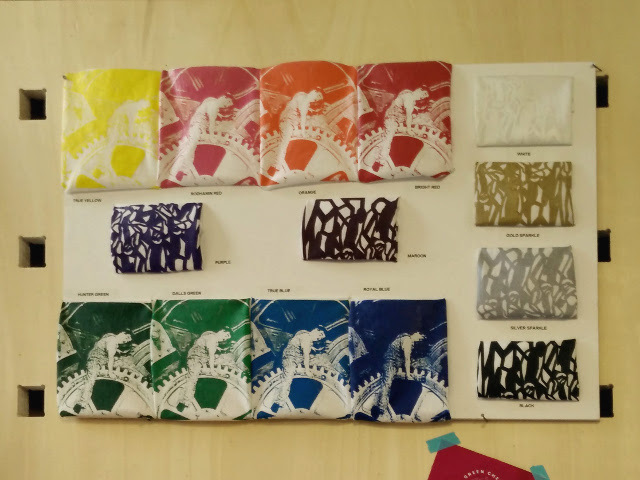 I had learned during my START course that I needed to purchase a screen printing kit (which cost 21€ and contained the fabric for the screen itself, as well as the ‘magic screen’ kit, which is what is used to print the design onto before fusing it to the screen) and some ink (8.90€). 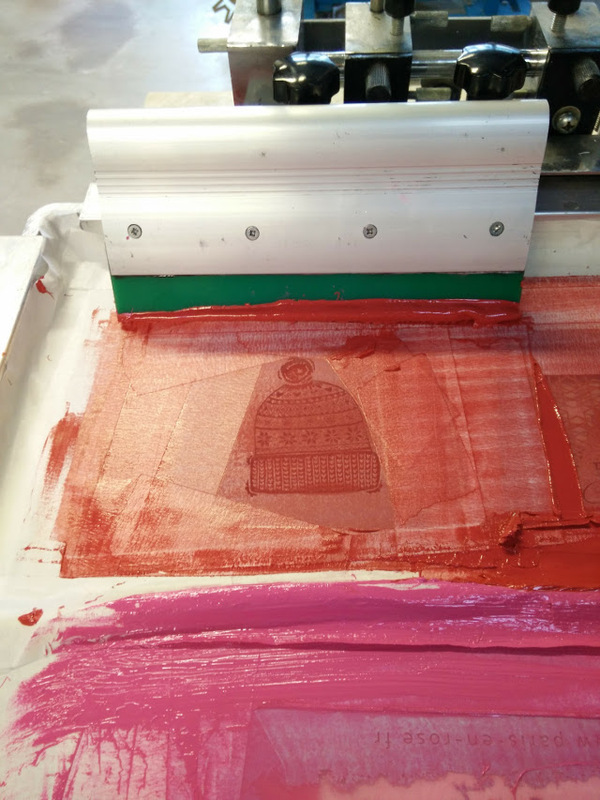 The first step is to print the design(s) onto the special film from the ‘magic screen’ kit. Now that I knew what was needed, I had prepared my designs in advance. The designs need to be printed in black and white only, and need to have not too many very small details. 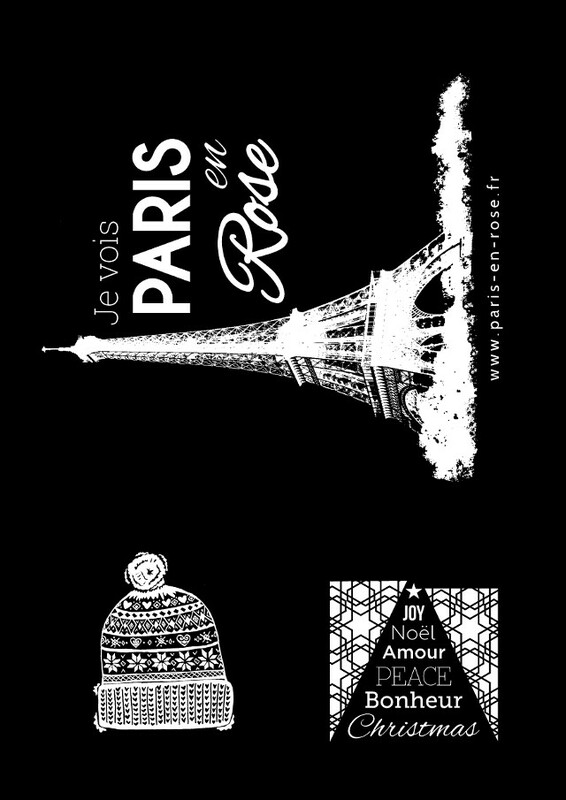 I prepared one large Paris en Rose design, to print onto t-shirts, hoodies and tote bags, and two small designs to print onto recycled fabric for Christmas cards. These 3 designs fitted onto the one A3 ‘magic screen’ that came with the kit. 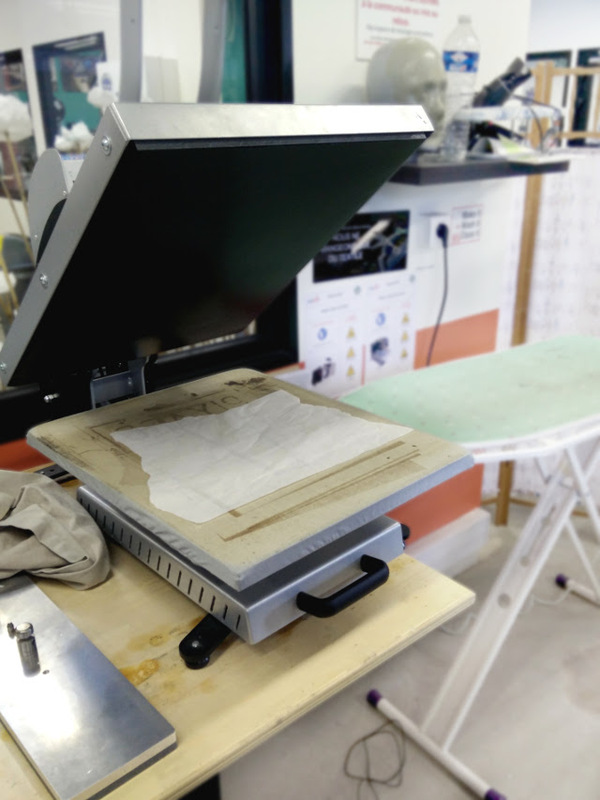 Once the design is printed, the film needs to be pressed with the other special sheet from the ‘magic screen’ kit in a hot press. This step is a bit tricky, and we had a little bit of trouble with it during the START course, as it involves peeling the two layer apart while they are both still hot. 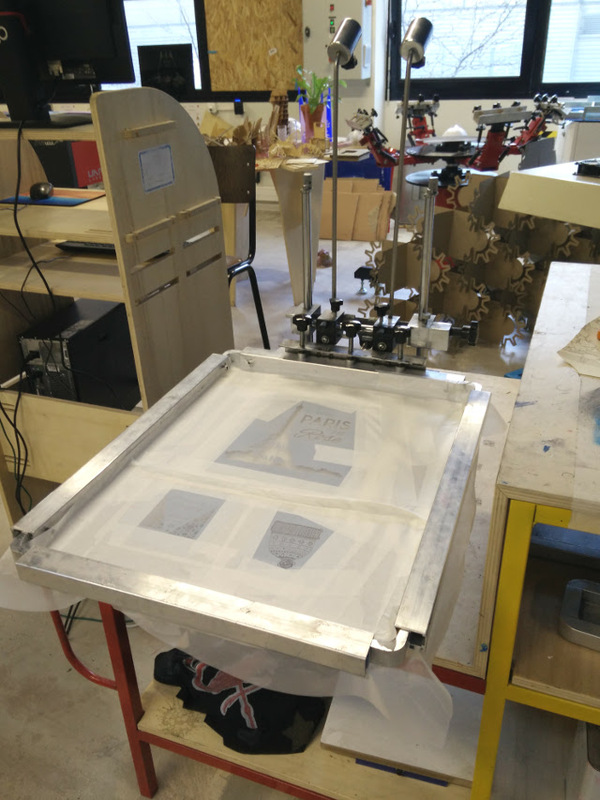 Once completed, this step leaves you with your printed design on a plastic film, along with a special glue which will later fix the design to the screen. The next step is to make up the frame, with the tools and information provided. Then you need to decide where on the frame you need to stick you design. This will depend on what you are printing. 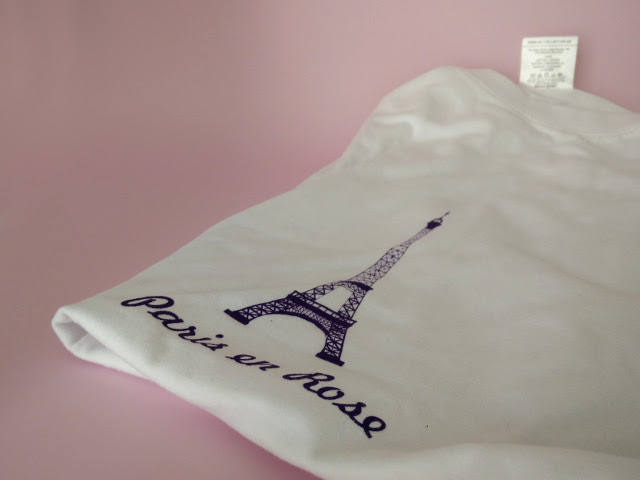 I optimised the placement of my Paris en Rose design on the screen for printing tote bags, for example. But when I tried to use it to print t-shirts it was less conveniently placed. The hot press is used again for this step. Then the screen needs to be taped up so there are absolutely no gaps anywhere, including around the edges, except for where your designs are. I also added a slightly raised edge made with tape and rolled up paper, to separate each design, since I was going to use different coloured inks. 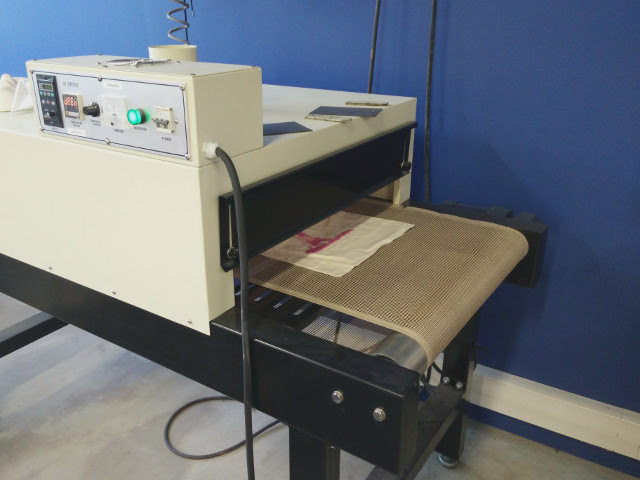 The screen then is attached to the printing press, and adjusted so it is level, and the correct distance from the base. Then you are ready to print the designs. For the tote bags, the bag is placed around the base, and stuck to the surface with temporary spray glue so it doesn’t move. The ink is placed on the screen and passed through the screen with a squeegee. This took a bit of practising to get the technique right. And it is important that the press is adjusted correctly too. 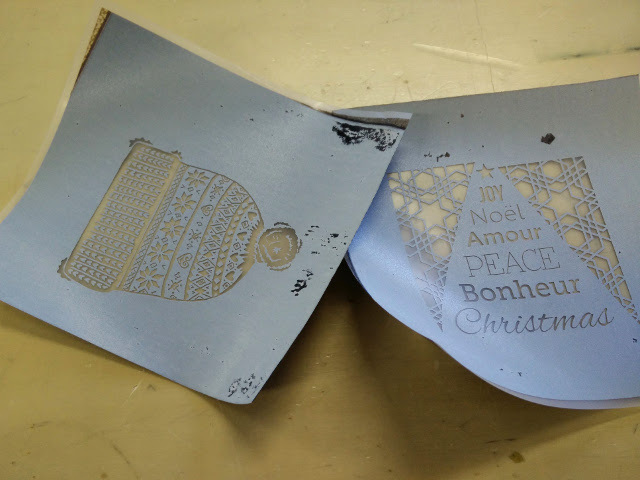 I was lucky enough to get some help from another Techshop member who showed me how important it was to evenly spread the ink over the design before each print. The final step is to cure the Ink in the conveyor dryer. This heats the ink up to around 180° which makes it durable and washable. And that’s it. I was really pleased with all of my screen printed creations, and would love to do more screen printing at Techshop in the future. 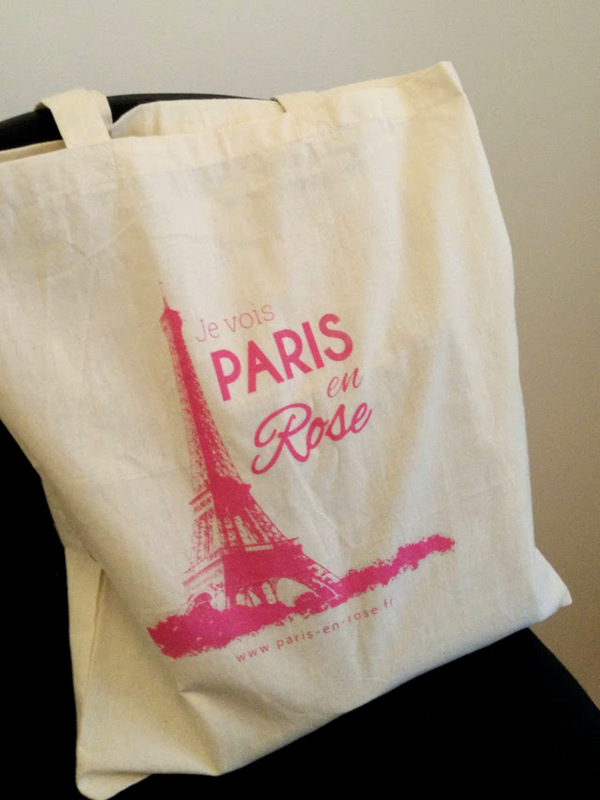 I especially love my Paris en Rose bags, and the Christmas cards, which are available on my Etsy shop. Get 15 % off with the code JAN2017SALE! 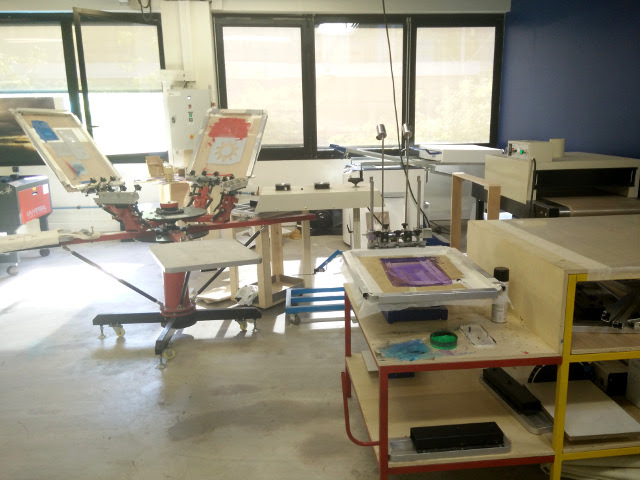 I’m looking for any summer workshop in France about all printing techniques: etching, aquatint, lithography, giclée, screen printing and each other you know.